How about some Magic for that special event of yours? Yes we do travel! We have performed as far away as Seattle, Texas and lots of other places! It's tough to be popular! 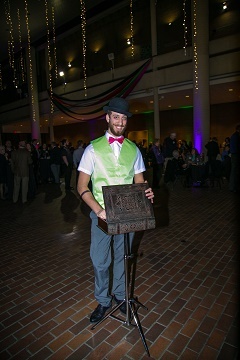 Ask about a customized magic show for your event! Ask about what other entertainment we can provide! Call us today for great and funny magicians! 513 921-5454! Chris is an award winning magician and cruise ship headliner. Chris has been performing magic full time for over a decade. 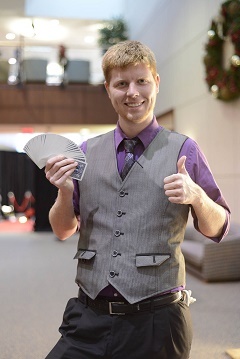 Chris has recently returned from Carnival Cruise lines and is now available for corporate magic, trade shows and other large venue performance. Chris' blend of comedy and magic leaves people spellbound and laughing long after your event is over. Don't miss out on having Chris perform at your next event. Chris uses a unique blend of comedy and magic in order to create one of a kind memories. 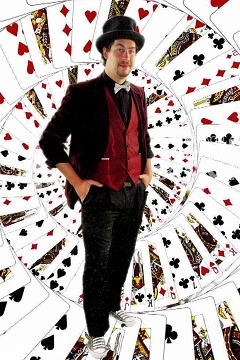 Dan Luckett is zany creative magician who will have you laughing till tears are streaming down your face. Dan is excellent for kids shows, school shows, corporate parties. You'll love having him at your conferences and after parties. Dan recently debut his new after prom headliner show featuring a straight jacket escape! Hysterical magician Adam Leite is a great addition to any event. Adam is friendly and funny and great at improve. Adam is also a stiltwalker, juggler, and balloon artist. Adam is as strong an addition to a corporate event as he is for kids event. Alban is the winner of several talent shows. Alban has an excellent dry comedy stage show and is charming and funny. Alban will keep your kids laughing and you'll love his warm style. Please enter your name, phone number, and email below to have a Representative call you.